Ermellinato di Rovigo Turkeys are from Veneto, a region of northern Italy. 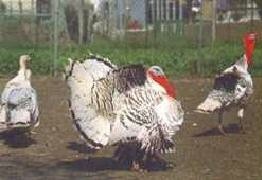 They were derived from a mutation in the offspring of crosses of local birds to American Narraganset Turkeys in 1958. But it was good mutation and they were then selected for increased performance. The Ermellinato di Rovigo is very rustic and well suited to pasture production. They mature at 7 months and feather early. They produce 70-100 eggs / year. The eggs are white to rose colored and they weight 70-80g. They are medium-sized (males weight 10-12 kg, females weight 4-6 kg).